Modeled on the popular Asterix Adventures, these Ojibwe-centric graphic novels—two, so far—are set in eighteenth Century colonized North America. The protagonists are Ojibwe brothers dealing, in their inimitable ways, with their land-hungry new neighbors. Rabbit is a shrewd, cunning little guy, a headstrong kid who often confuses bravery with bravado. His younger brother, Bear Paws, is way larger and stronger, kind of gullible, and always ready to pull Rabbit out of a scheme-gone-awry. The two are good, likable kids, sprinkling themselves with spirit powder to transform into animals, trying to get out of trouble, trying to get out of chores, and generally remembering the old stories and the traditional lessons they impart. In “The Sugar Bush,” our young heroes encounter a troop of bumbling British soldiers who don’t speak Ojibwe and have no idea how to live on the land. In “The Voyageurs,” Rabbit and Bear Paws embark on what might be the single strangest journey in the history of the fur trade. 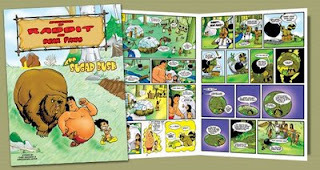 The Adventures of Rabbit and Bear Paws is available from Oyate.